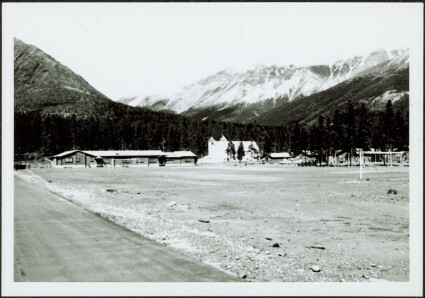 Photograph depicts building containing Cassiar's bar and snackbar, visible across ball field. This building originally housed school classrooms, movie theater, barber shop, and rec centre with three pool tables. Private liquor store originally located in far right of building. Liquor store was known to be the only legal bootleg liquor business in the province at the time, before it was transferred to Cassiar's government liquor store and replaced with a Sear's office. Catholic church and other buildings are visible behind trees in right midground. Road and field in foreground, valley and mountains in background. Community Centre located behind photographer, out of frame, curling rink on photographer's right. Item is part of the Cassiar Asbestos Corporation Ltd. fonds. Image is one of 45, see items 2000.1.1.3.19.33 - 2000.1.1.3.19.77. See also item 2000.1.1.3.19.30 for image featuring bar and snackbar in 1961.